The team at Block and Tackle have launched their fair share of big projects over the years and are no strangers to process. With Post-Office, their soon-to-launch roving pop-up coworking space concept, they wanted to build it as intelligently as possible. So, they did what they tell their own clients to do all the time: They called in the experts at J+E. Getting to start from scratch with a new consumer product is just about every designer's dream. And helping to create Post-Office's user experience, to flesh out its business model, and even to craft its voice delivered on every point—for us and for our client. 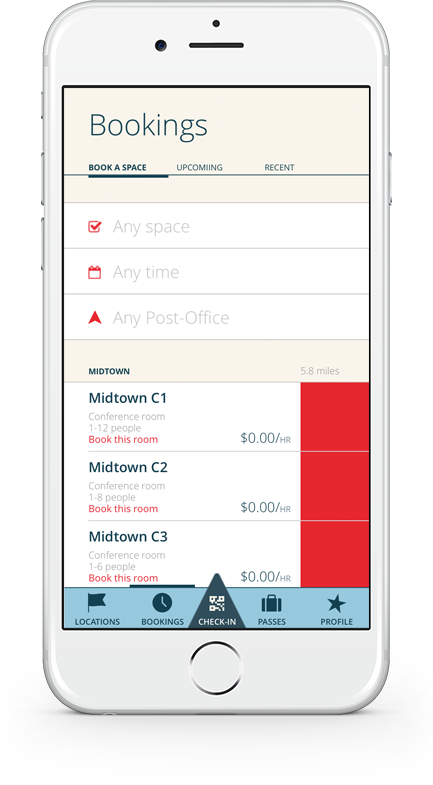 The finished Post-Office app lets account-holders and guests easily find locations, buy and share passes, and get to work quickly and with a clear picture of what the co-working space has to offer. J+E's one-week Unicorn Rescue program is structured as a series of steps from business analysis and research all the way to user flows and design. With Post-Office, we spent each day, from morning to evening, camped out in the co-founder's Atlanta home, scribbling ideas in dry-erase on living room windows, subsisting on delivery sandwiches, and analyzing every facet of the project. 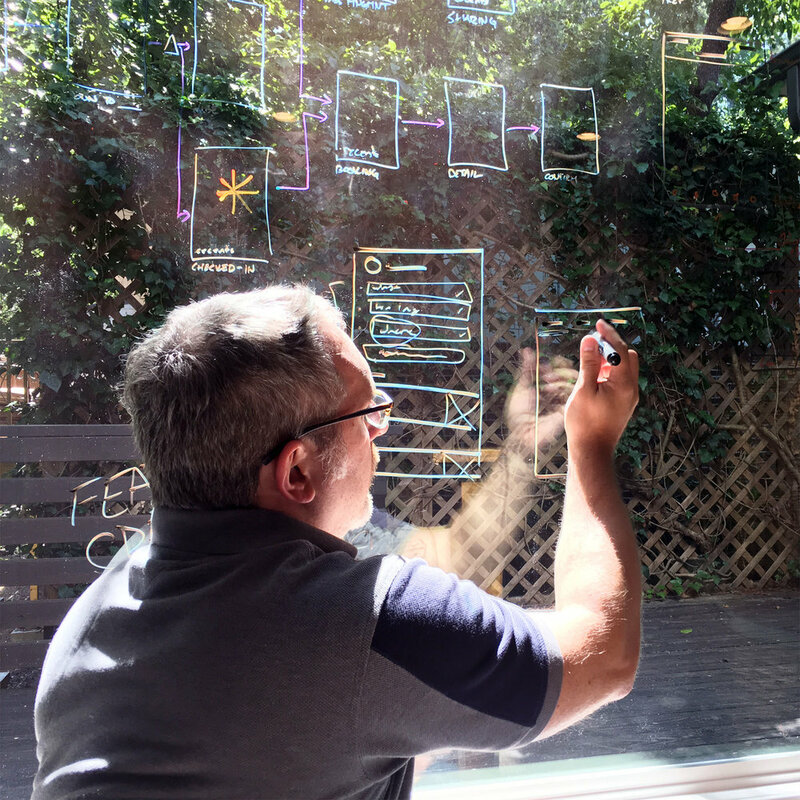 By Friday, we emerged from a living room papered in Post-It notes feeling inspired, armed with a deeper understanding of our users, and equipped with a business model that’s pretty damn close to bulletproof. We've all used coworking spaces from time to time and thought that gave us a head-start on knowing what our users might want. But ultimately, our users’ wants and needs outweigh our own. So, we spent the first two days of the Unicorn Rescue engagement doing competitive research and user research. We came out with a comprehensive understanding of the people we’d be reaching and that warm, fuzzy feeling that comes from having your own guesses and hunches validated by data. And while those first 48 hours were research-intensive, on Wednesday, the magic started to happen. We started taking what we learned and putting it toward real-life features. User research was planned, conducted, and synthesized in under two days. Raw user research was synthesized using affinity mapping to find themes among qualitative data. Pseudo-persona were derived from the mapped user data, painting a clear and surprising picture of our user. Sketched flows and wireframes quickly put the experience in scope and highlighted opportunities. One of the coolest parts about locking a bunch of brilliant creative people in a room together for a week? You’re practically guaranteed at least one momentous a-ha moment. One of our favorites came after hearing from users that one of the trickiest parts of coworking is finding a place that matches your vibe: some people are there to mingle and chat, others prefer to plug in and work uninterrupted with minimal distraction. And the two don’t really mesh that well. Cue the Vibe Meter: our solution for feeling out the social vibe and noise level of a coworking venue before you even set foot inside the door, provided by in-app check-ins. It’s a way for users to scope out the feel beforehand—and it’s an idea we never would’ve developed without doing this kind of intense user research. So with this kind of information in hand, we committed the second half of that first week to designing a robust—and, shockingly high-fidelity—prototype and testing it. This allowed us to quickly test pricing, language, flows, and more complex ideas like our daily pass concept and sharing mechanics—all before committing the development-ready design assets or a single line of code. The vibe meter—shown here as a newly checked-in user would interact with it—elicited a lot of excitement from usability testers. Initial testing focused on users understanding the checkin process. Testing included their understanding of location details and the vibe concept. We also assessed the flows for booking and e-commerce. Testing also confirmed the business model and sharing mechanics. With the initial week complete—and many lessons learned—we entered the second phase of our project and spent the next few weeks iterating on the original prototype with an eye toward creating a complete design solution that would work on a variety of devices and for an even wider variety of users. 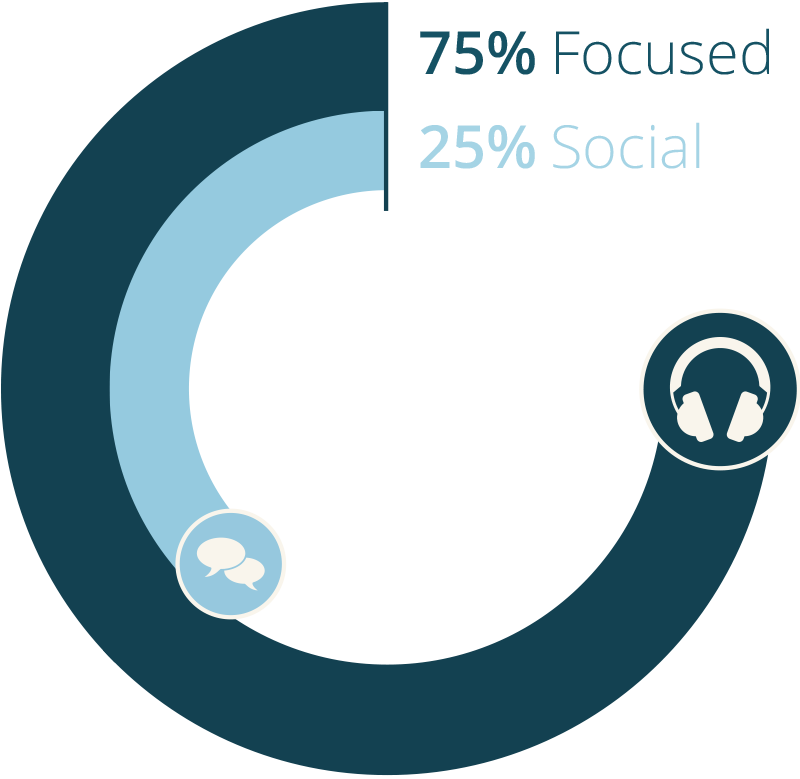 The original week's scope focused on a handful of priority flows for mobile users. And many of those priorities received additional development. The vibe meter, for instance, went through several more rounds of design and technical validation. Additionally, many processes which had been designed for the mobile user underwent design for the tablet or desktop user. And, as with many other projects, the mobile-first process delivered on a simpler and more elegant desktop solution that we might've developed the other way around. The vibe meter—the data visualization used to communicate the atmosphere of the location—went through several redesigns and rounds of testing before landing on this solution. In getting the rapid prototype leveled-up for development, many mobile-first layouts and interactions benefited from significant adaptation for larger screens. The mobile-first approach radically improved what might-ve otherwise been form-heavy or text-heavy desktop interactions. 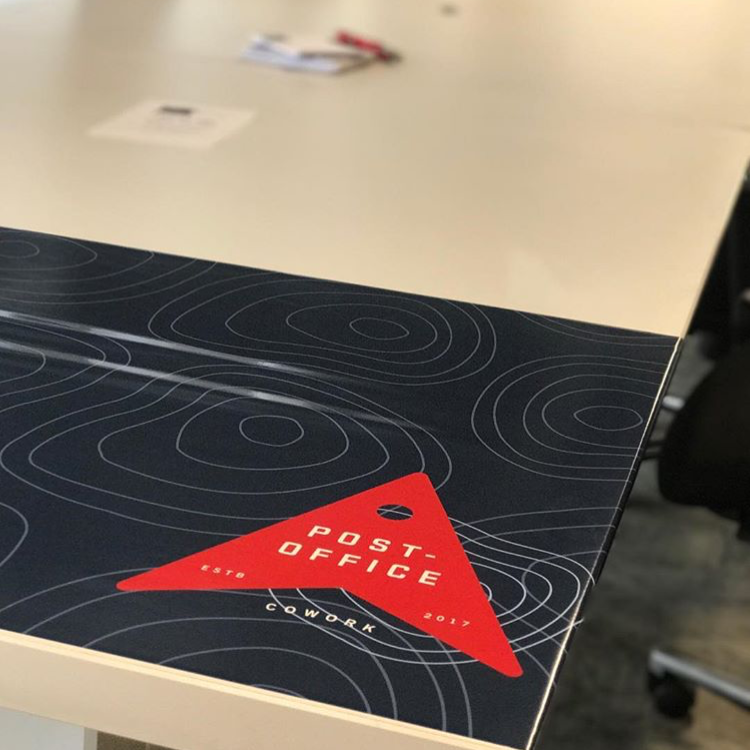 Post-Office recently launched their first pop-up location at the design and technology conference, SuperNova South—offering attendees a peek at the spaces and amenities they could look forward to as the co-working locations begin to appear around Atlanta. Additional locations have since been announced and we're excited to get out of the home office, out of the coffee shop, and get to work! The mobile-web and app solutions make finding and getting into a Post-Office incredibly easy and fast.